UPDATES UPDATES UPDATES! With one of the largest lots in Penzien Farms, the coveted 3 car garage and a 2 minute walk to the community pool and clubhouse, whats not to love! With professionally redone hardwood floors, brand new carpet, beautifully remodeled kitchen AND 2 remodeled bathrooms in 2018, nothing more to do but move right in! Priced to sell and featuring award winning Utica Community Schools, walking distance to the Macomb Rec Center and easy access to expressways. 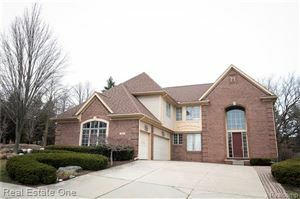 New roof 3 years old/30 yr dimensional shingles with transferable warranty, premium crown molding, huge family room with beautiful slate and crown finishings plus formal living and dining rooms. extensive 2-tier stamped concrete patio in back featuring a private vine-grato as well as an extended courtyard porch out front.